It gives us great pleasure to inform you this February, The Jaisalmer Desert Festival is your definitive one-stop to take a deep dive into the colours, the sounds, the smells, the sights, the glory and that unadulterated bliss that is Rajasthan. The Jaisalmer Desert Festival returns with a melange of eclectic renditions and soulful melodies in a resplendent celebration of awe-inspiring Rajasthani art and culture. Romantic, remote and unspoiled, the festival is set to the backdrop of the majestic city’s forts, the Gadisar Lake and then the beautiful dunes of the Thar Desert. The Festival, spread across three days, is a colourful extravaganza of the art, music and culture of Rajasthan with a strong message of revival of local arts and folk music together with women empowerment. True to its legacy this year to the Jaisalmer Desert Festival coincides with the Magh Pournima (full moon day of the Hindu month of Magh that essentially falls in February), as it runs between the 20th to the 22nd of February, 2016. February, the Jaisalmer Desert Festival is your definitive one-stop to take a deep dive into the colours, the sounds, the smells, the sights, the glory and that unadulterated bliss that is Rajasthan. The Jaisalmer Desert Festival returns with a melange of eclectic renditions and soulful melodies in a resplendent celebration of awe-inspiring Rajasthani art and culture. Romantic, remote and unspoiled, the festival is set to the backdrop of the majestic city’s forts, the Gadisar Lake and then the beautiful dunes of the Thar Desert. The Festival, spread across three days, is a colourful extravaganza of the art, music and culture of Rajasthan with a strong message of revival of local arts and folk music together with women empowerment. True to its legacy this year too the Jaisalmer Desert Festival coincides with the Magh Pournima (full moon day of the Hindu month of Magh that essentially falls in February), as it runs between the 20th to the 22nd of February, 2016. 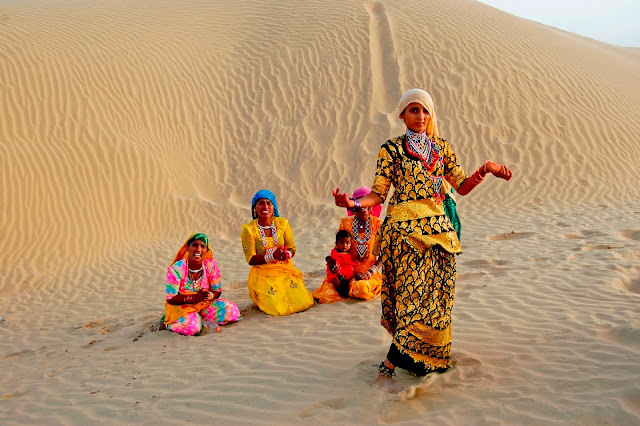 Celebrated as one of the “must do” things in Rajasthan this season, the entire city, including the stretch of Sam sand dunes (42 km from Jaisalmer), will turn into a montage of vibrant colours, festivities and enthrallment. The celebrations of this festival make the desert come alive with color, enthusiasm and happiness. Even as it focusses on wholesome entertainment and engagement; at its core the Festival focuses on reviving the local arts, the local crafts and the sounds that are so Rajasthan. “Jaisalmer Desert Festival is not an implant but a homegrown coming together of Jaisalmer’s people in festivity and tradition. It is Rajasthan as Rajasthan is: pure, undiluted; a sensory overload. As partners and consultants, Percept One has endeavoured to present Jaisalmer and its historic Desert Festival at its pristine best. A work in progress we endeavour to elevate the experience year on year,” explained Nupur Mahajan, CEO Percept One. The festival begins with a ceremonial procession known as Shobha Yatra where local Rajputs and other clans dress in their traditional attire. 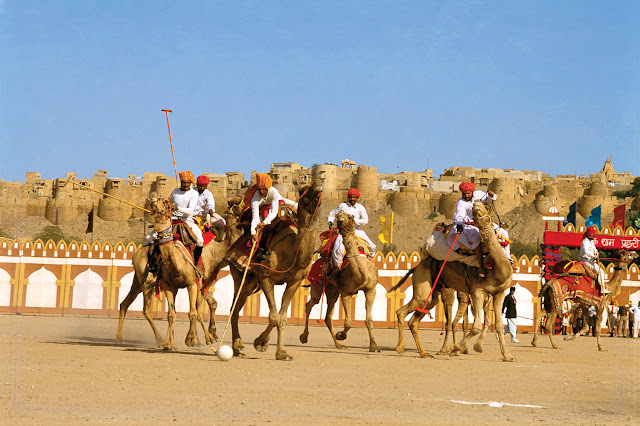 Men carrying swords atop horses, camels, and elephants are cheered on as they enter the Dedansar Stadium, one of the main venues of the desert festival. The locals dress in traditional and bright costumes. They sing and dance depicting the tragedies and accomplishments of the desert. The Gair and the fire dance are highlights of the festival among other Indian dance forms like Lavani and Kalaripayattu. The Kalabaz or the Nats are a group of local nomads who are popular for their gymnastic acts. The Bhopa’s Langhas and Manganiars create an enchanting environment with their poignant folk music recitals and ballads. Be a spectator of rare competitions like camel polo. Cheer for camel races. Gymnastic stunts on camel back and camel formation dancing are the crowning jewels of the festival. The Border Security Force Camel Tattoo follows these competitions. Tug-of-war, turban tying, Maru-Shri (Mr. Desert competition) and the longest moustache competition are other allures seepd both in a rich legacy and equally a contemporary setting. Folk music is at the very core of the festival and this year performers include the mellifluous Swaroop Khan and the celebrated folk singer Manganiyar Ghazi Khan. Kutle Khan - the voice of Jaisalmer, would make the desert come alive during the grand finale...an evening set at the majestic Sam sand Dunes. The festival also takes a plunge into rendition of old folklore Moomal Mahendra wherein Princess Moomal set herself on fire (Sati) to prove her love for Prince Mahendra. 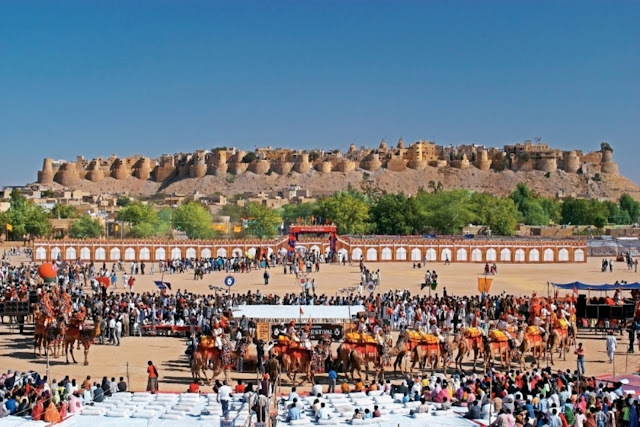 This year the highlights include “Jaisalmer’s Got Talent” – a talent hunt and felicitation of local artistes & performers from the fields of art and music. Ecelectic food, interesting stalls displaying artifacts, handicrafts and other souvenirs will also be a Festival highlight. Desert safari and camping can be also enjoyed at the eve of the festival. The festival is a sensory overload of all things Rajasthani, which is extensively popular with tourists from across the globe. The festival ends in the Sam dunes with the “Sonar Qila” Jaisalmer Fort in the background creating a fairy-tale ambiance with a promise to come back with even more fun and entertainment next year.